cooking, dinner, Jay B. Landis, Kitchenary, meals, southern cooking, traditions, Verse Assignments, Virginia cooking, Whatever Happened to Dinner? Thanksgiving 2012, at my sister-in-law’s home. Jay B. Landis recently published a book of fine poetry, “Verse Assignments” which I have been enjoying. He was a professor of mine at Eastern Mennonite University and taught in the English department over 50 years, which was my major. But I’m finding out much I didn’t know as I’ve been reading both his small volume and his wife, Peggy’s “Kitchenary” memoir, both published at the same time. 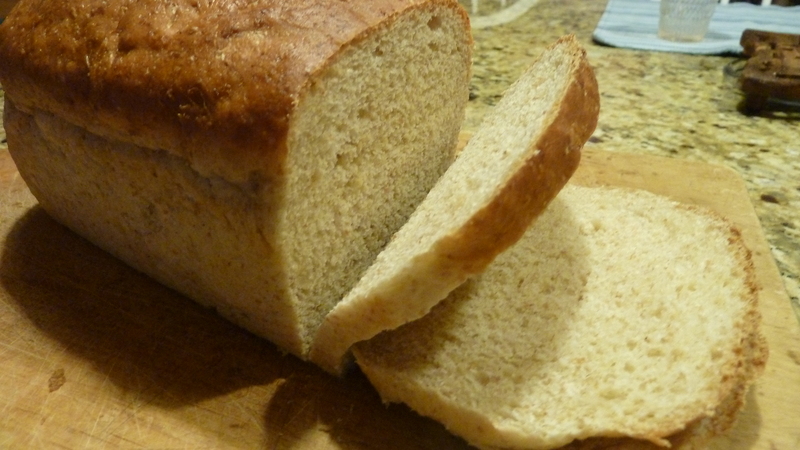 At home, in Pennsylvania, we passed the bread first. For more information on the book see the website Verse Assignments. Used by permission. I grew up in northern Indiana, a Yankee for sure, and married my Virginia-born and bread sweetheart, Stuart. Luckily for him (and me too) I had already been broken into southern ways, living in north Florida for a year, and then Kentucky for another, and had three years of Virginia living (although let’s face it you don’t really encounter true Virginia living on a college campus, right?) before I ever ran into him (or rather almost fell down at his knees, but that’s a story for another time). I think that usually when we had company in Indiana, the tradition was to pass the bread first. Mom frequently invited folks from church, which we loved, especially if they had kids. I loved helping Mom “set the table pretty” (as we said) and I can still see it in my memory but I doubt we have any pictures of her clear and bright green bubble china and the simple but special glasses we saved only for such occasions. 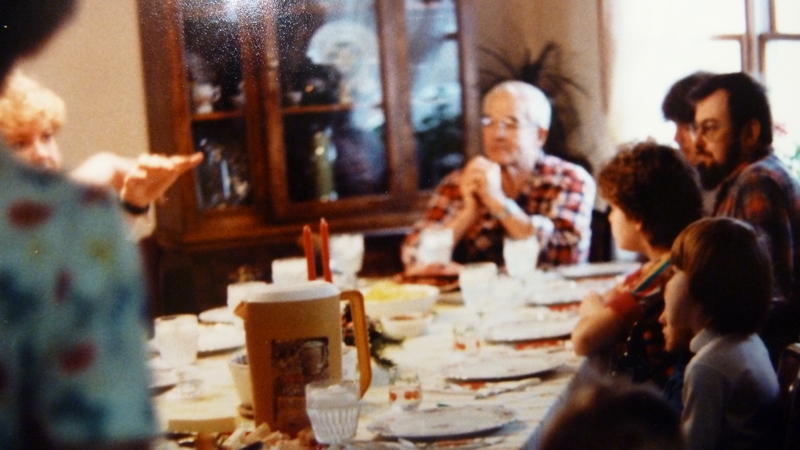 Dad ready for the blessing, my parent’s home, Indiana, Christmas dinner, circa 1988. 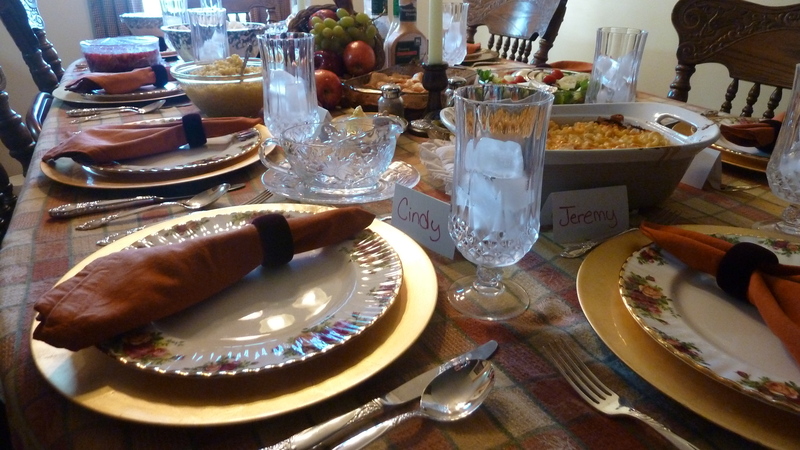 I still love to set the table pretty—and the moment when we all sit down and have a blessing. And then, well, somewhere along the line, without even realizing it, I guess I’ve gotten used to passing the meat first. I guess I’ve become Virginian or Southern if passing the meat first makes you that. More likely, the controversy is whether you go clockwise or counterclockwise, and no matter how hard you try to get everything going one direction, something (the gravy, the butter, the salad) is sure to go the opposite. Not that it matters. 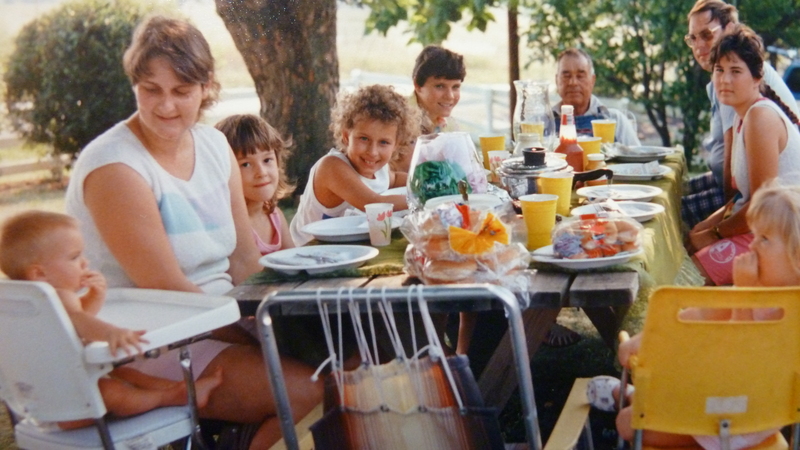 My father-in-law, Hershal, at the far end of this picnic table, circa 1987. I think he said this partly to encourage us to get on with it—let’s pass stuff, I’m hungry. But it was also a blessing reminiscent of Christ’s own pronouncement and blessing at the last supper, in Matthew 26:26: “While they were eating, Jesus took bread, and when he had given thanks, he broke it and gave it to his disciples, saying, ‘Take and eat ….’” My professor’s poem also points to the sacramental quality of passing the bread before the meal. I’ve learned many other southern or Virginia customs, traditions, and tastes over the years, including a love for sweet tea, grits, country ham, turnip or collard greens with a splash of vinegar, the savory taste of green beans cooked for an hour with ham or bacon seasoning. I know: the long cooking ruins any hint of vitamins, (and I also love gently cooked or sautéed green beans with garlic or maybe seasoning salt) that have just turned bright green. But if you look at long-cooked green beans as a “savory” side and not your main nourishment, you can learn to appreciate them. When we try to find harmony across cultures and families, a great place to start is the dinner table. When do you pass the bread at your table? Or maybe you’re saying, uh, who passes anything? Who sets the table? I’d love to hear comments! A table of mostly bonafide Virginia eaters, and at this meal the meat and bread would have been passed at the same time: in a sandwich! 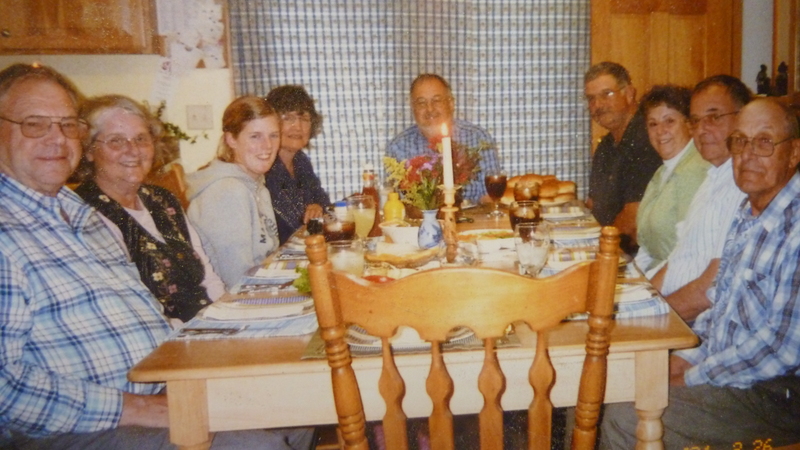 My bro and sis in-law Richard and Barbara, daughter Doreen, yours truly, husband Stuart, friends/former neighbors Bob and Barbara, bro-in-law Nolan, and neighbor Harold. Photo taken by his wife, Willie, who does a great job taking the time to get photos right: people looking at camera, curtains closed in the back to avoid glare. Thanks, Willie, for sharing this photo. Doreen, Stuart, Michelle, her husband Brian, Tanya and her husband Jon. My 2010 book, Whatever Happened to Dinner? has some Davis Virginia specialties in it, but also recipes from a wider group of families from my office. I love the homey-ness of your blog. We need more of them! My mother and grandma always had a rhubarb patch with fresh rhubarb in season, which became sauce and pies. And, yes, our family always sits around the table for at least one meal a day, a healthy practice which has been passed on to our kids and their families. « Finding harmony between sweet and sour: Rhubarb Crunch time!